Return to Spring Styles top page. This album contains 75 individual sheets of U.S. Navy ship "preliminary design" plans, dating from October 1939 through November 1944. These drawings, prepared by the Preliminary Design Section of the Bureau of Ships (known as the Bureau of Construction and Repair prior to June 1940), were used to illustrate potential ship designs for the Navy's General Board, generally in response to characteristics proposed by that body. Termed "Spring Styles" by the Preliminary Design staff (after ladies' fashion catalogs), the drawings were an important part of the development of the design of a particular ship class. The "Spring Styles" plans usually represent only some of the options presented to the General Board, with the others existing only in tabular form. They also do not often represent final designs, which were developed in detail following approval of basic characteristics and were frequently changed in the process. However, the drawings in this album provide insight into the designs of many of the major (and some of the minor) warship types constructed during the Second World War, and others which were considered but not built. This album, labeled "Spring Styles" Volume # 3, was loaned (less drawing numbers 64 & 65) by the Naval Sea Systems Command (NavSea 501), successor to the Bureau of Ships, in 1986 for photographic copy work and retention. With the exception of the two drawings not loaned, its contents were declassified in November 1985. Drawing numbers 64 and 65 were later declassified, and they were also loaned for copy work and (re)addition to the album. Following nearly two decades in Naval Historical Center custody, in 2005 this volume was returned to Naval Sea Systems Command for permanent transfer to the U.S. National Archives. The album is of loose-leaf format, with grey-green fabric covers measuring 16.9 inches high by 22.35 inches long. Its individual plans are of a variety of sizes, though most are drawn to a scale of 1/32 inch to one foot. Plans are drawn in ink and/or pencil on pale off-white drafting paper or linen, with many of them also containing informal pencilled notations. 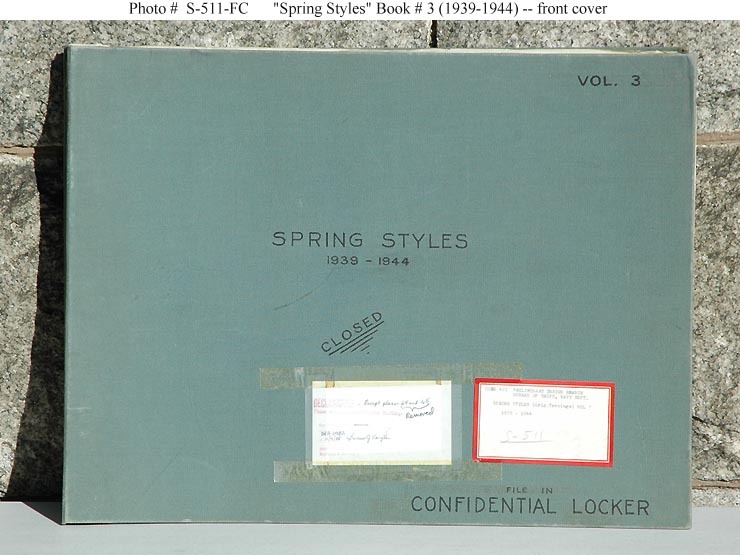 Other volumes in the "Spring Styles" series are presumably held by the U.S. National Archives. 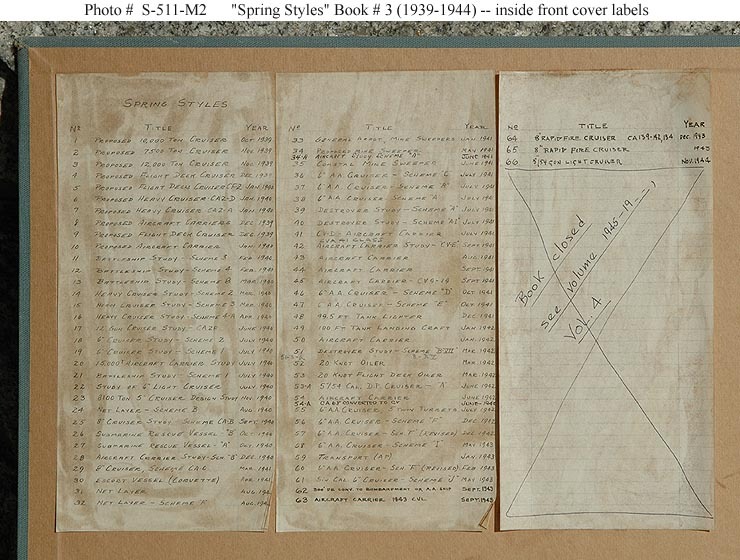 Among the background documents for the volume presented here is a content listing for "Spring Styles" Volume 4, giving its location as National Archives' Record Group 19, Entry 1026P. Its contents are dated from 1946 to 1954, with other drawings in the same Entry (mainly Contract Plans Books) bearing dates from 1939 to 1951. Persons interested in this material, as well as "Spring Styles" volumes predating Book # 3, should contact the National Archives for information. Select one of these presentation pages to examine the individual drawings. Note: Some individual drawings are listed under more than one ship type. On the picture data sheets referenced from this page, click on the thumbnail image (small photograph) to prompt a larger view of the same image. Front cover of "Spring Styles" Volume 3, from the Bureau of Ships (Bureau of Construction and Repair until 1940) preliminary design book series, containing drawings of proposed U.S. Navy ship designs prepared between October 1939 and November 1944. The original book, featuring 75 individual drawings, measures 16.9 inches high and 22.35 inches long. It was photographed at the Washington Navy Yard, D.C., on 30 September 2005. 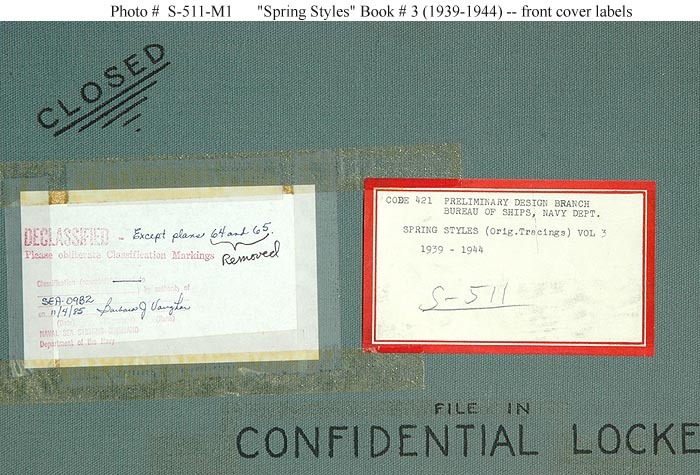 Labels and some text on the front cover of "Spring Styles" Volume 3, from the Bureau of Ships (Bureau of Construction and Repair until 1940) preliminary design book series, containing drawings of proposed U.S. Navy ship designs prepared between October 1939 and November 1944. These labels provide declassification information and identification data for the volume. The photograph was taken at the Washington Navy Yard, D.C., on 30 September 2005. Inside front cover and first drawing of "Spring Styles" Volume 3, from the Bureau of Ships (Bureau of Construction and Repair until 1940) preliminary design book series, containing drawings of proposed U.S. Navy ship designs prepared between October 1939 and November 1944. Labels on the inside front cover of "Spring Styles" Volume 3, from the Bureau of Ships (Bureau of Construction and Repair until 1940) preliminary design book series, containing drawings of proposed U.S. Navy ship designs prepared between October 1939 and November 1944. These labels provide a listing of the plan series featured in the volume. The photograph was taken at the Washington Navy Yard, D.C., on 30 September 2005.